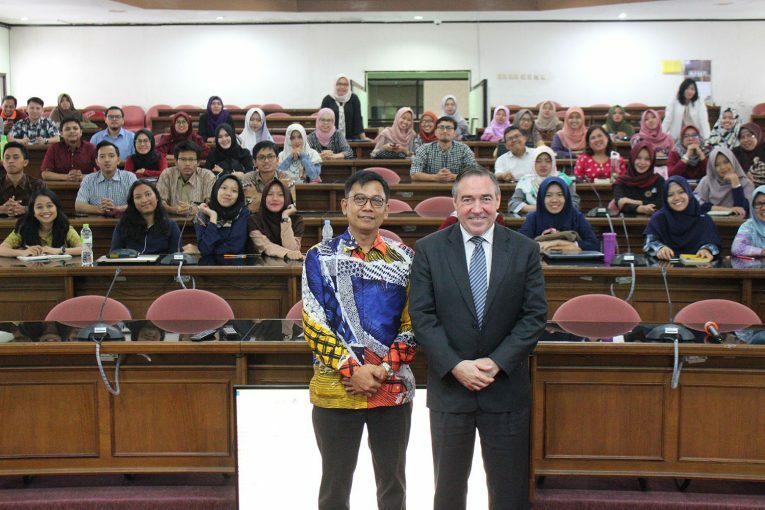 Yogyakarta – Friday, March 15, 2019, the Master Science and Doctorate (MD) Program Faculty of Economics and Business, Universitas Gadjah Mada held a guest lecture entitled “Global Leadership: Challenges and Implications for Research.” The speaker at this event was Professor Robert Evans (Dean International, Faculty of Business and Law, Curtin University, Australia), and moderated by Dr. Amin Wibowo, MBA, a lecturer at the UGM Faculty of Economics and Business. The event was held at the BRI Auditorium, 3rd Floor, MD FEB UGM Building, and was attended by students of the MD FEB UGM Program. The main topic in this guest lecture is the global challenges currently faced by the business world. At the beginning of the event, Prof. Evans explained related to business conditions globally, poverty, human rights and social movements, business ethics, and corporate sustainability. Furthermore, Prof. Evans highlighted the relationship between company directors and managers where the director must oversee the management of the company by the manager. The relationship between these two can also be viewed by the agency theory approach. The agency theory itself explains the relationship between agents (managers) and principals (directors). Prof. Evans explained that besides agency theory, the relationship between managers and directors can be assessed by the legitimacy theory. This perspective emphasizes that an entity will carry out certain social activities if management feels that certain activities are expected by the community in which the company operates. Both of these theories are a form of how the theoretical implications resulting from research are able to answer problems related to leadership. There are three main conclusions in this guest lecture: 1) social obligations on companies are increasing, 2) if using agency theory fully interrogate underlying assumptions – carefully consider policy implications, 3) consider alternative theories. Prof. Evans and his colleague, Ms. Patricia Kelly, besides attending the event, also intend to discuss the initiation of cooperation proposed by the MD FEB UGM Program. Dean of FEB UGM and some faculty members attended the meeting, including Dr. Eko Suwardi, Prof. Catur Sugiyanto, Dr. Nurul Indarti, and Dr. Amin Wibowo. During this time the collaboration between the MD FEB UGM program and Curtin University is still held for the MSc in Economics. Meanwhile, the MD FEB UGM Program, in general, FEB UGM wants to expand to other study programs, especially the MSc in Management and MSc in Accounting. This educational collaboration may be in the form of a double degree or exchange program. At present, the MD FEB UGM program has also collaborated with other universities in Australia. Dr. Nurul Indarti explained in detail about the double degree program that had been held with one of the universities in Australia. She pointed out related to the educational process scheme, fees, and target markets. Responding to this, Ms. Patricia from Curtin University also provided an overview regarding the collaboration of MSc in Economics which had previously been running.